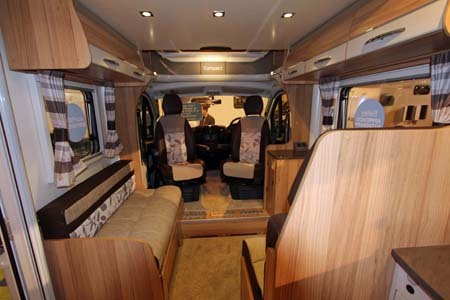 The much awaited and hyped Bailey Approach Compact Motorhomes were launched in October. 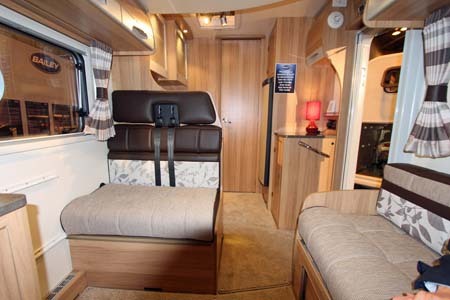 There are two models in the range; a two-berth Approach Compact 520 a low-line, end bedroom with a fixed double bed, designated travel seats and a garage. 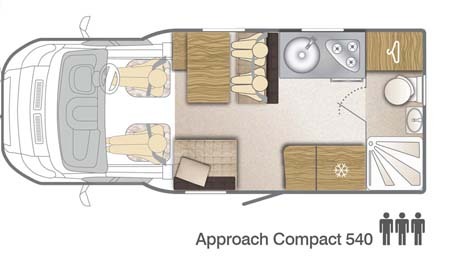 This model is complemented by the Approach Compact 540, a three-berth end washroom layout with designated travel seats and a drop down double bed. 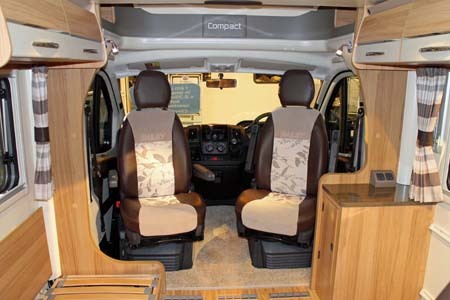 Both models have “panel van” advantages and practicalities in terms of footprint, running costs and user-friendliness, without the sliding nearside door, yet have traits from coach built models in terms of specification taking cues from the well established Autograph Approach range. Both models share the same cab and engine specification; 2.2Hdi 130bhp engine with six speed manual gear box and the Peugeot Boxer Euro 5 cab with fully adjustable swivel seats, twin air bags, opening sun roof, cab air conditioning and cruise control as standard. 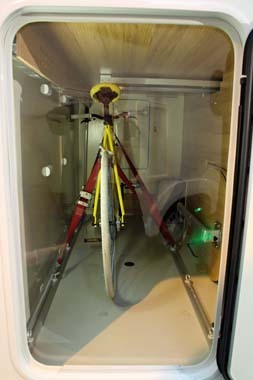 The chassis is the new ultra-low profile lightweight AL-KO AMC, advantages of which include a low level entrance step. 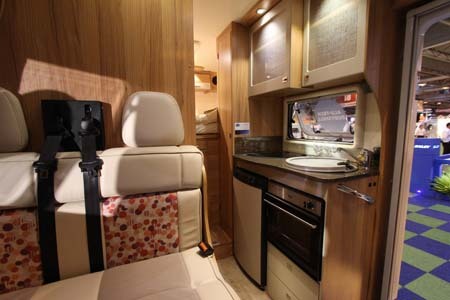 As you’d expect both models are built using Bailey’s patented and award-winning Alu-Tech construction system and unusually for models of this size and in this price bracket feature the Alde wet radiator system with a digital control panel. Surprisingly both models have a 90L fully insulated external fresh water tank and a 90L waste water tank; both are practical as is the 105Ah auxillary battery housed in a dedicated under floor storage locker. 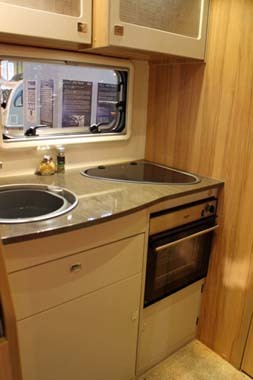 Interiors are light and spacious, even in the tardis-like Approach 520, with high gloss worktops, sparkling chrome handles, a three burner gas hob and a combination grill and oven. The 540 has a larger fridge than the 520. High level lockers in the kitchen have a linen look finish which complements the Bailey walnut cabinetry and coordinate well with the upholstery, Trafalgar, a rather contemporary colour scheme or Piccadilly, a leatherette style seating a slightly more conservative style. The Approach 520 has two stereo speakers and a television point in the bedroom area, three over bed lockers, down lighters and spot lights. 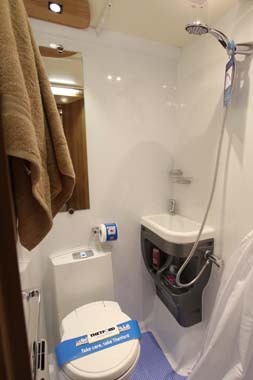 Washrooms despite the internal dimensions are big enough to swing a cat in and have a fully lined shower cubicle and water saving EcoCamel shower head. 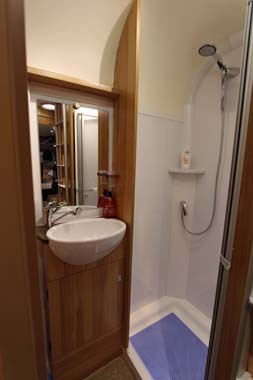 The Approach 520, a centre washroom, has a shower curtain and the Approach 540 has a bi-fold acrylic door. 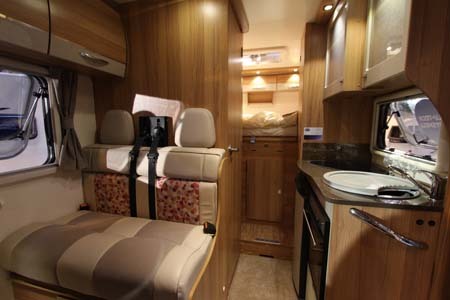 Optional extras include a microwave oven and bespoke bedding sets. Only two models in the range, we were told but it’s our well-educated guess that the range will expand over the coming months. The Autograph Compact 520 is remarkable; it’s the ultimate putting a quart into a pint pot, but with room to spare. The Autograph Compact 540, in the same size body shell, really maximises the use of the interior space with its drop down bed. 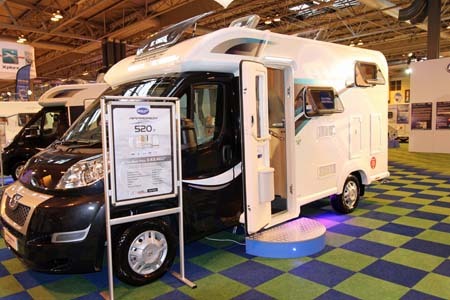 Bailey hit the motorhome market running two years’ ago and has really made its mark in that time. 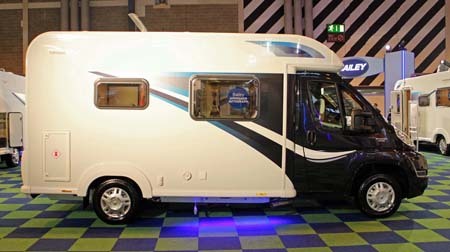 Will these dinky motorhomes be award winners like the bigger Approach Autograph models? Very likely, we say. Front transverse single; 7ft 4ins x 2ft 1ins. What would the road tax be on the 540. Thanks. Sorry for the delay Rich. We’ll look into that for you. I can confirm that the Compact 540’s road tax for 12 months is £230, for 6 months it would be £126.50. Apologies once again for the delay. Hi Lucie, I just thought about something. I drive an Automatic which I prefer now. Do they, or will they do an automatic one? I do hope so. Hi Julie – sorry for not getting back to you sooner. I wanted to get exact details from Bailey before responding to your comments. 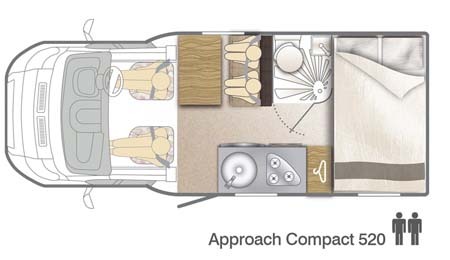 Bailey’s Marketing Manager tells me that because Peugeot don’t offer a automatic option for the Compact base vehicle, only a manual caravan is available. Well now this is what I would like to have. There is only me and my 2 dogs and the 520 would be ideal. I would have to sell my home to get one, but I could live in this quite easily. I wouldn’t mind selling my Mazda Bongo for this one. A real Beauty. Great to hear you’re a fan Julie! If you do decide to buy one, make sure you let us know what you think!